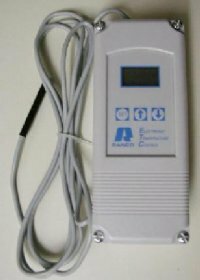 Use this digital Ranco ETC 111000 unit to control the temperatures of your fermenter, hot liquor tank and mash tun. The Ranco ETC is a microprocessor based temperature controller suitable for switching 120Volts at up to 16Amps for heating or cooling applications. Your electrical device plugs into this unit which plugs into the outlet. If the temperature lowers below your set point, the device is turned on. Buy the Ranco ETC 111000 here for the best price and service. Additionally you can also buy the Thermowell for Ranco Controllers. Thermowells are used in industrial temperature measurement to provide isolation between a temperature sensor and the environment whose temperature is to be measured. This thermowell is for use with the Ranco temperature controllers.